Our Funarena! : And…Four First-Class Fools! They can make real fools of you! They smile knowingly at you, give powerful nods of understanding to you and even chuckle-grin-shrug at your occasional takes of humor. You get just no inkling of the immensity of their foolishness. If you happen to associate with them in work or business you are living dangerously. You will be taken out on a right-royal ride of hopelessness finally rendering you unable to differentiate day from night! 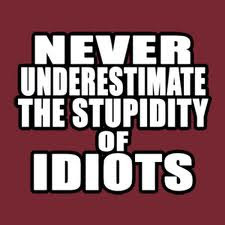 It has been a matter of grave concern that the numbers of ‘intelligent’ fools are rising continuously in India in recent times creating a most dangerous species of human beings. They may attack you anytime anywhere and put you in jeopardy. They can be justifiably called ‘First Class Fools’. In an effort to properly define them I have been surfing the net and finally landed on a spiritual-philosophical site. I found there a very infesting tale which I thought of reproducing here. ‘Once Emperor Akbar asked Birbal to bring him four of the world's worst possible fools. 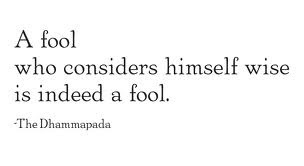 So the following morning Birbal began looking for the fools. The first fool he saw was a Brahmin. This Brahmin was running very fast carrying a plate of betel-nut, rice and a few other things. When the Minister asked the Brahmin why he was running, the Brahmin answered, "My wife has just given birth to a son, and I am bringing her the ceremonial foods. Unfortunately, the boy is not my child, but his father will also be there. So I am going to bless the new father and mother, and the baby. That is why I am running." "Ah!" thought the Minister, "I have got my first fool," and he told the Brahmin to come to the court with him. "No, no, no! I cannot come to the court," protested the Brahmin. "I have to see my wife." Birbal declared, "I am the Emperor's Minister. It is the Emperor's command that I take you," and he showed the Brahmin his identification. So the foolish Brahmin had to go to Akbar's palace. On the way, they saw a man sitting on a horse. On his shoulders was a very heavy load. Birbal asked him, "Why are you carrying that load on your shoulders?" The man replied, "My horse is a mare, and she is pregnant. I do not want to hurt this poor animal by making her carry such a heavy burden, so I have put the load on my own shoulders." Birbal said, "If you are sitting on the horse, the weight will be the same whether it is on your shoulders or on the back of the horse." But the man insisted that he was taking half the burden on his own shoulders. "Here is another fool," Birbal said to himself, and he commanded this fellow to come along to the Emperor. "Your Majesty," proclaimed the Minister when they came before Akbar, "here are your fools." "I asked you to bring me four fools, did I not?" said Akbar. "Where are the other two?" "I have two here," replied Birbal, and he narrated their foolish actions to the Emperor. Then he said, "The third fool is you, your Majesty. Who but a fool is interested in seeing fools? You get pleasure in knowing that there are horrible fools in your Empire, whereas a wise Emperor would like to know whether there are wise men in his Empire. Since fools give you pleasure, you also belong to their group, for birds of a feather flock together.